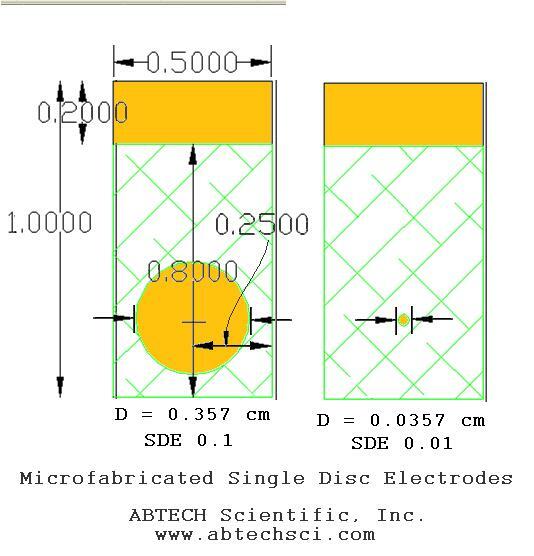 Ø Single Disc Electrodes (SDEs) are inert, microfabricaed electrodes formed from a microlithographically patterned insulator-on-conductor-on-insulator configuration. They are designed for the study of electrical and electrochemical properties of thin polymeric films and coatings, for applications in microelectrochemistry, for electrical/electrochemical impedance spectroscopy, and for chemical and biological sensor development. Ø Microfabricated from 100 nm magnetron sputter-deposited gold (Au), e-gun vapor-deposited platinum (Pt), or conductive indium tin oxide (ITO) on an electronics grade borosilicate glass, these devices are supplied in two disc diameters. A 500nm thin silicon nitride layer is applied over the conductor and is microlithographically windowed using reactive ion etching to reveal a precisely patterned window to the metal beneath and a bonding pad. SDEs are avalable as un-packaged die. Ø SDE chips of gold, platinum or ITO are available with 0.357 cm diameter (A=0.10 cm2) or 0.0357 cm diameter (A=0.01cm2 ) discs. Ø In research and product development, these devices are widely used for electrochemical, bio-electrochemical, biofuel cell, electrical and electrochemical impedacne spectroscopy. Ø These electrodes/devices are particulary necessary when a precisely defined area electrode is required. Ø As a substrate electrode for the deposition of electroactive polymer thin films, alkane thiol monlayers, for electrodeposition of carbon nanotubes, for SAM innobilization of enzymes and enzyme-linked antibodies for biosensor development. Ø For the study of electrical and electrochemical impedance spectroscopy of organic thin films and coatings and carbon nanotubes. 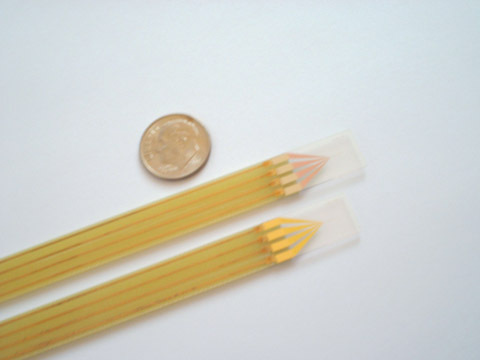 Ø As a capacitance probe during the deposition or cure of an organic thin film or polymer e.g. Films based on Langmuir-Blodgett thin film deposition or cure of an epoxy. Ø In modern microelectrochemistry -- as generator and collector electrodes in electrochemical amplification or in the performance of electroanalysis in high impedance environments. The microdisc electrode format allows accommodates radial diffusion . Ø In conductimetry studies. To determine the conductance of low conductivity media and in conductimetric titrations. Ø In coatings research and development. For example, to study the transport of water into and through a coating or to study the physical aging of the polymer upon environmental exposure or accelerated aging. A single disc, 0.357 cm diameter. Ø Films or coatings may be applied to the SDE device by dip coating, spin casting, spray painting, air-brushing, brush painting, by Langmuir-Blodgett thin film deposition technique, by electropolymerization, and/or by molecular self assembly. Ø The chip may be immersed in organic, or aqueous medium to a level above the geometric area occupied by microdiscs. 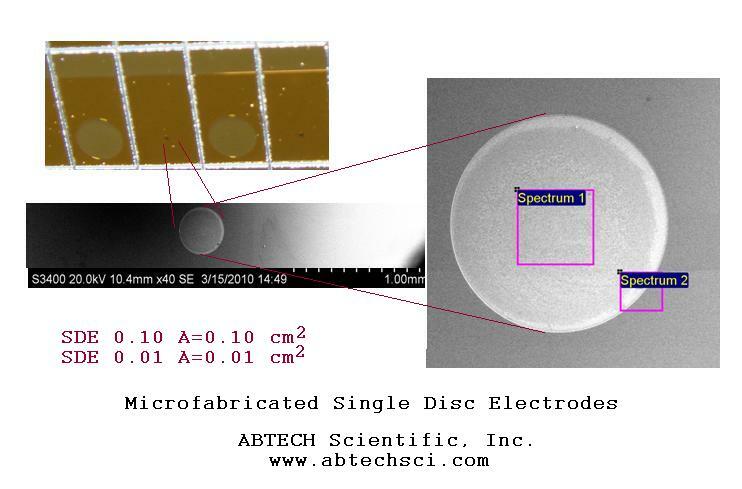 Single Disc Electrodes (SDETM) is the tradename for a family of devices developed by ABTECH. 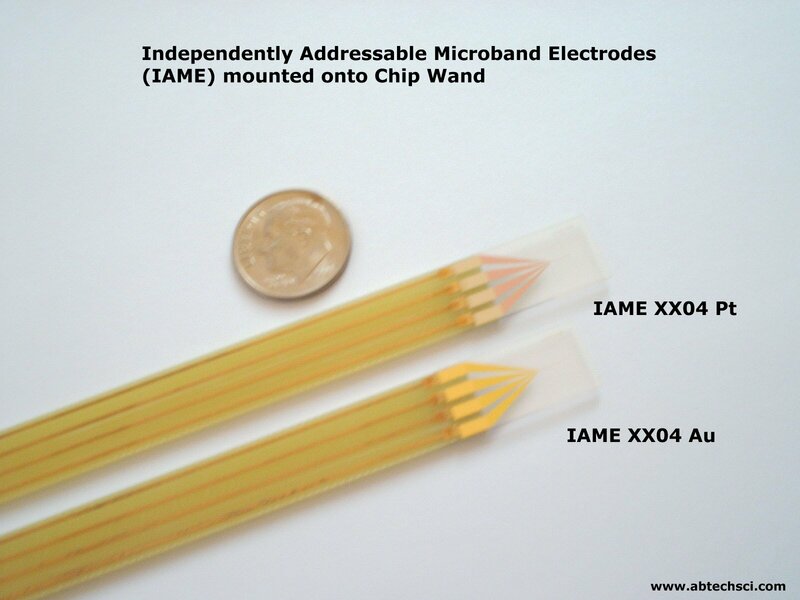 Also called microelectrodes, these devices are microfabricated (using microelectronics fabrication techniques) to form patterns of conductors deposited on an insulating substrate chip. Last Revision 04/03/2010, (c) 2000-2010 ABTECH Scientific, Inc.